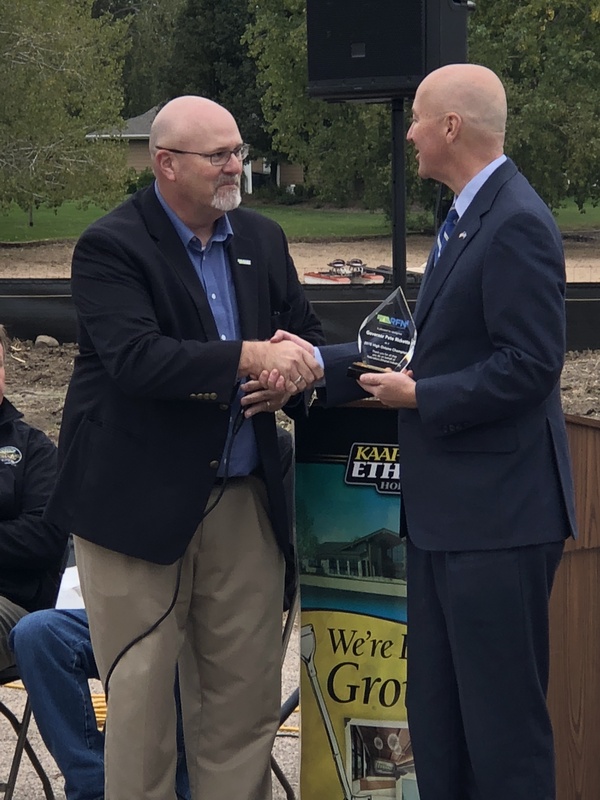 KEARNEY, NEBRASKA, October 1 – At a ceremony at the site of KAAPA Ethanol Holding’s future headquarters in Kearney, Governor Pete Ricketts has been recognized as a 2018 High Octane Champion by Renewable Fuels Nebraska, the trade association for Nebraska’s ethanol industry. The award was developed by the RFN membership as a way to recognize public policy leaders that strongly support Nebraska’s $5 billion ethanol industry. Ricketts took the lead on offering up the state of Nebraska to conduct a comprehensive and scientific study to test the use of E30 blended gasoline in conventional, non-flex fuel state vehicles. After over a year of consideration and constant pressure by Ricketts, the EPA announced just last week that the application for the E30 pilot study was approved and can begin. The study will be administered by the state of Nebraska in conjunction with the University of Nebraska and will be completed in 18 months. Much attention will be on Nebraska and this study, with ethanol proponents such as RFN excited at what the data may show and how higher, mid-grade ethanol blends could be used in the future.